This is a guest blog post written by Click Rain. You can learn more about Click Rain here. 13.1 Miles. That’s approximately 26,000 consecutive steps. Excuse me while I take a nap. I’m already tired. The thought of running a half marathon is something of nightmares for most. We’re here to tell you it is doable, and training for it can even be fun. We said it, fun. Accountability, camaraderie and improved performance—these are all benefits to training with others. And at Click Rain, nine brave souls are conquering the first-ever Sioux Falls Skedaddle Half Marathon together. Saying you’re going to run a half marathon and actually doing it are two different things. To keep our Click Rain Skedaddle team accountable and on track, we log our miles on a shared Google Docs spreadsheet. It’s an easy way for each of us to track our progress, while also feeling a bit of friendly pressure to keep at it, especially on days we feel like skipping a training run. The American Society of Training and Development found people are 95% more likely to meet their goals if they team up with others and set up recurring progress check-ins. Our team of mostly beginner runners is setting themselves up for success. If you’re dreading training for a marathon and are literally dragging your feet, training with others will give you the pick-me-up you need to lace up your running shoes and hit the pavement. And at Click Rain, there’s no shortage of camaraderie. Our team uses an internal communication messaging tool called Slack to communicate in real time with each other. If you’re not familiar with it, you can create channels on any topic—from client projects and motivational sayings to a “what’s for lunch” channel. Our runners started a “Skedaddlers” Slack channel to get each other pumped up and motivated for the big day. Funny GIFS, friendly training reminders, and some old-fashion words of encouragement are all shared within the channel. Accountability plus camaraderie translates to improved performance. As the snow starts to melt, our team will take their training outdoors with group runs. Running alongside others provides that extra push to keep going. And come on, a little competition never hurt anyone! It can only help you go farther, run faster, and provide an extra boost of confidence. 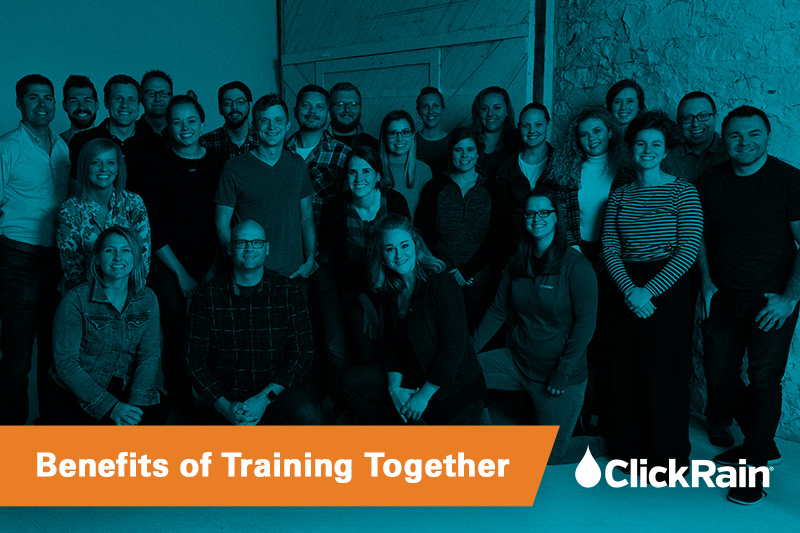 At Click Rain, we’re setting the pace for marketing technology. Learn how we’ve helped clients from a variety of industries reach and exceed their marketing goals.